The European Parliament's Italian president, Antonio Tajani, has provoked outrage for suggesting fascist dictator Benito Mussolini did some "positive" things before he turned bad. Before following Hitler into war, Mussolini had "built roads, bridges, buildings, sports facilities", he said on Italian radio. Political opponents have expressed their shock at his remarks. 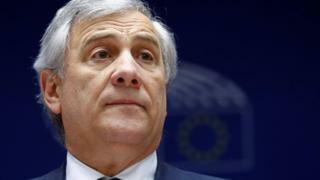 But Mr Tajani has hit back, accusing people of manipulating his words. "I've always been a convinced anti-fascist," he insisted. Speaking on Italy's Radio 24, Mr Tajani spoke about the legacy left by Mussolini, who he said had "remade many parts of our Italy". "Up until he declared war on the whole world, following Hitler, and passed the racial laws... he did positive things to create infrastructures for our country," Mr Tajani said, referring to measures that banned Jews from schools and limited their professional, economic and social lives. He pointed to the building of roads, bridges and other major infrastructure projects. "In terms of the concrete things done, you cannot say he didn't do anything," he said. But adding context to those remarks, the centre-right Forza Italia politician said that Mussolini was not a "champion of democracy", that his anti-Jewish laws were "crazy" and that bringing Italy into war was "suicide". "Generally speaking I don't think his government action was positive," he said. As the controversy erupted, Mr Tajani tweeted an unambiguous condemnation of fascist ideology and accused critics of taking selectively quoting portions of his words. He later released a fuller, more apologetic statement, saying: "I apologise to all those who may have been offended by what I said." "I am deeply saddened that, despite my personal and political history, some may feel that I would choose to be lenient with regards to fascism." There was immediate criticism of Mr Tajani's radio interview. Some MEPs in the Strasbourg parliament brandished posters featuring Mr Tajani's face, with the caption "never again fascism". Dutch MEP Marietje Schaake of the Alliance of Liberals and Democrats group tweeted that there had been "major uproar, demands for explanation and also calls for the resignation of the president of European Parliament" at the session. Image caption In Strasbourg, many held aloft posters of Mr Tajani with the words "never again fascism"
German MEP Udo Bullmann from the Socialists group said Mr Tajani's quotes were "unbelievable". "How can a president of the European Parliament fail to acknowledge the nature of fascism? We need swift clarification," he said. At home, Stefano Buffagni of the populist Five Star party, which is in government in Italy, said that Mr Tajani had revealed his true face - and that he should be ashamed of what he had said. Tuscany governor Enrico Rossi said Europe had been born from the tragedy of Nazism and fascism, and anyone who headed the European Parliament should always bear that in mind. "Mussolini, he may be responsible for 430,000+ murders, but hey, check out his roads and bridges," tweeted Irish MEP Lynn Boylan. Mr Tajani is close to former Italian prime minister Silvio Berlusconi- who made a similar faux pas several years ago, suggesting Mussolini had done "some good things". Mussolini's National Fascist Party came to power in Italy in the aftermath of World War One, backed by with armed groups known as blackshirts who intimidated his opponents. The Fascists seized power in the early 1920s, dismantling democratic institutions – and Mussolini became Italy's dictator in 1925. He supported Gen Francisco Franco in Spain's civil war and backed Adolf Hitler in World War Two. Mussolini adopted some of Hitler's policies - notably the anti-Jewish laws of 1938 that stripped Italy's Jews of their civil rights. More than 7,500 Italian Jews died in the Holocaust. Mussolini was executed after his capture by Italian partisans in 1945, while attempting to flee the Allied advance.